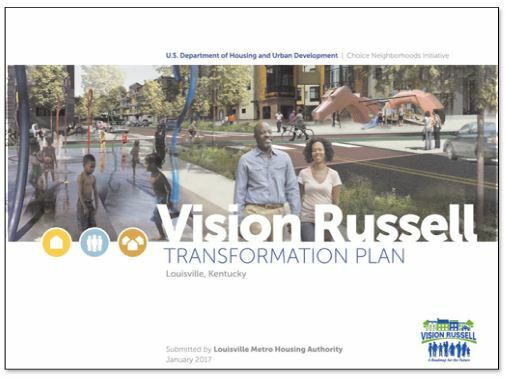 To view the final Vision Russell Transformation Plan, click here. To view the executive summary of the Vision Russell Transformation Plan, click here. Goal A.1: Russell children enter kindergarten ready to learn. Goal A.2: Russell school age children are proficient in core academic subjects, and graduate high school college or career ready. Goal B.1: Residents enjoy good health and strong sense of well-being. Goal B.2: Russell’s built environment supports health and safety. Goal C.1: Russell residents are financially secure. Goal C.2: Existing Russell businesses are encouraged to stay and grow, and new commercial activities are drawn to the area to further stimulate growth. Goal D.1: Beecher Terrace replacement housing is located in vibrant, sustainable, mixed-income communities that serve as catalysts for new investment. Goal D.2: Russell offers a variety of high-quality, affordable and market-rate homeownership and rental housing opportunities. Goal E.1: Russell residents are engaged in their community, civic life, and connected to resources. Goal E.2: Residents have safe and convenient multi-modal transportation options to access services, amenities and jobs. Goal E.3: Russell residents have the skills, tools, and ability to access and use modern technology and the internet.